Show Yourself A Little Love! 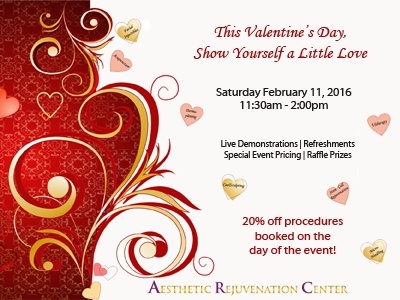 This Valentine’s Day, show YOURSELF a little love by joining us for an aesthetic event to learn all our effective non-surgical procedures to keep you looking and feeling your best! 11:00am-11:30am Facial Injectables: Complimentary consultations to learn about which facial injectables are best for you. 11:30am-12:00pm CoolSculpting: A Non-Invasive Fat Elimination Treatment. Start to get Summer Ready! 1:00pm-1:30pm Nova Threads: Facelift in minutes! No Downtime! NovaThreads are the hottest procedure on the market right now offering immediate results. This non-surgical procedures uses dissolvable surgical sutures to lift and tighten the skin.